This article describes the basic setup and calibration that should be performed before launching Plane. Set your transmitter mode switch to Manual. This is a safe mode in which to start up the system. When you power on your board at the field, you should leave the plane motionless on the ground until the LEDs stop flashing blue and red (about 30 seconds). This means that the gyros have been calibrated. If the flight controller has a safety switch connected, it must be disengaged before the vehicle can be armed. LED Continuously on indicates: Safety has been disengaged. The flight controller may be armed with Throttle down and to the right. Both the Safety engaged and Safety disengaged conditions require the button to be held down for 5 seconds to toggle them. This is a safety mechanism to prevent accidental disarming during flight and accidental arming during transportation. If the vehicle has an airspeed sensor then the pre-flight checks described here should be performed before each flight. 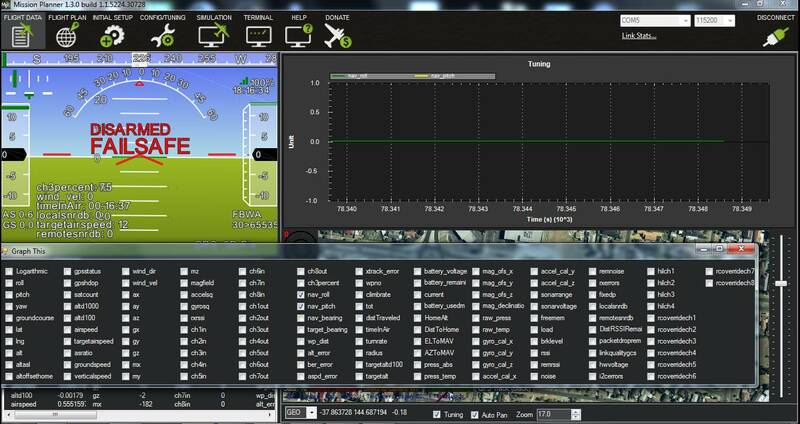 You should wait for GPS lock before flying which is normally indicated by the flight controller’s LEDs becoming green. 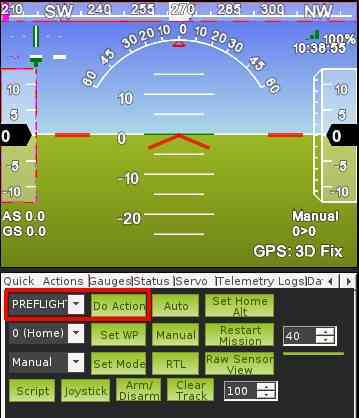 If you do not wait for GPS lock the barometric altimeter calibration will be incorrect and RTL, Loiter, Auto and any other GPS dependent modes will not work properly. For Plane the home position is initially established at the time the plane acquires its GPS lock. It is then continuously updated as long as the autopilot is disarmed. This means that if you execute an RTL, your plane will return to the location at which it was armed. If the plane you arm is not a good return point then please setup a rally point instead. A rally point will be used in preference to the home location for RTL. BEFORE EVERY FLIGHT: before take off, hold the aircraft in your hands and switch to FBWA mode, then pitch and tilt the plane it to confirm that the control surfaces move the correct way to return it to level flight. (The ailerons and elevators will move; the rudder only coordinates turns with the ailerons in flight, so it won’t move much on the ground). This will ensure that you haven’t accidentally reversed a channel. You should do this before every flight, just as you move your control surfaces with your RC transmitter to ensure that nothing’s reversed. Failing to do this is the #1 cause of crashes. As a safety measure, your throttle will only arm on the ground in Manual mode, Stabilize or for an autotakeoff in Auto mode. It will not come on in any other Auto mode until you are in motion in the air. It is highly recommended that you switch into either Stabilize or Fly By Wire mode and observe the behavior of the control surfaces. They should move to return the plane to level when you pitch or roll it. If it isn’t rock solid, you can tune the gains by following the instructions here. If you have not tuned your PID gains then you may like to consider doing the first takeoff in AUTOTUNE mode. That will start the tuning process as soon as you takeoff. For your second flight, change the third mode (position 3 of your RC mode switch) to RTL in the Mission Planner’s mode setup page. Once in the air switch the vehicle into RTL. This will test navigation. The aircraft should return to the location at which it armed (or the nearest Rally point) and orbit at a fixed altitude (which can be set with the Mission Planner). If it does not return crisply and circle overhead in a near-perfect circle, you need to tune the autopilot a bit for your particular airframe. This can usually be done by adjusting the Roll parameters, as described here. Once all this has checked out, you can program waypoint missions and test them in Auto mode. If they are zero, then you need to adjust the AHRS_TRIM_X (roll) and AHRS_TRIM_Y (pitch) for the difference in angle between the autopilot board and your planes attitude when flying straight and level. You can change these by going to CONFIG/TUNING | Full Parameter List and adjusting the parameters as shown in the screenshot below. These parameters are in radians (every 0.01 is about 0.6 of a degree) so adjust in increments of 0.01 initially. If the plane turns to the left, AHRS_TRIM_X should be increased. If the plane loses height with mid throttle, AHRS_TRIM_Y should be increased.